Tokyo guidebooks don't give Ikebukuro much love. They'll lavish praise on the hip Shimokita, or swanky Roppongi, or even the Ueno Zoo more than they'll talk up Ikebukuro. One part of town the books always expend much ink on is Akihabara. And that's understandable. Some tourists will think, "Man, I gotta go to that super anime spot!" even if they don't know the first thing about anime. It's been about 16 years since I was really into anime, video games and other otaku stuff, so I found Akihabara to be operating on a different plane that my current state of consciousness. There's also a dearth of decent bars there. Yeah, one can find plenty of maid cafés, but they're not cheap and submissive girls ain't my thing. Maybe next time. If you're reading this post, you're likely more into drinks than otaku, so you may want to visit Ikebukuro if you're on the west side of the city. There's a different flavor of quirk, more bars and less of a commercial assault than in Akihabara (which is on the center-east side). And if you're staying in Shinjuku or Shibuya, Ikebukuro is a quick zip up the Yamanote Line. I enjoyed a rather extensive night in Ikebukuro, so I'm going to chop the recap into two posts, for your benefit and mine. After spending the morning and afternoon getting vaporized in the Kamakura heat, I came back to my apartment in Shinjuku to take a disco nap. I was planning on meeting up with Will, owner of Buffalo Tap and a good guy (and more about him as we go), at his bar in Ikebukuro around 11pm. It was going to be a long night, and I'm older than I should be, thus this system needed a rest. The sweaty nap went on an hour longer than planned, which meant I was going to miss out on some of my scheduled stops. But man, I was exhausted and this rest was restorative. By the time I got to Ikebukuro, the cat café was closed. The owl café was closed. Gyoza Stadium was closed. And I had to resign myself to the fact that I wasn't going to make it to Penguin Bar, something I do regret a bit. Food was a must. My plan was to go to Ichiran, but that location, like every other Ichiran I saw during my trip, had a line out the door. So I wandered around dizzily until stumbling into a ramen place without a phoneticized English name. And no English menu. 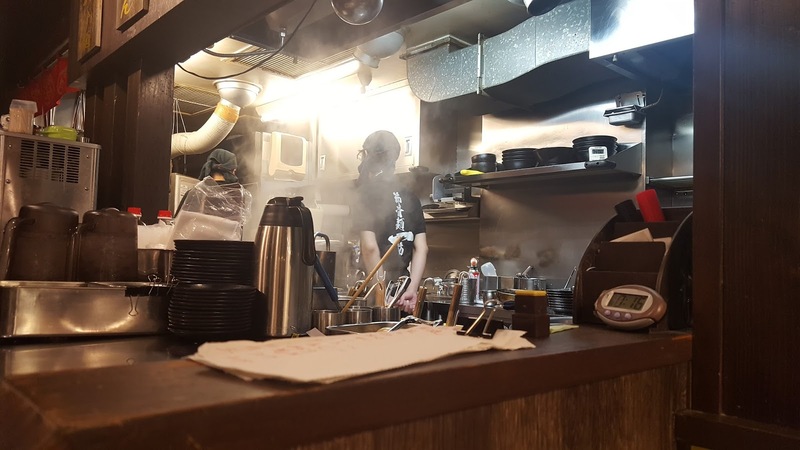 What most ramen restaurant kitchens look like. But there were pictures of dishes! 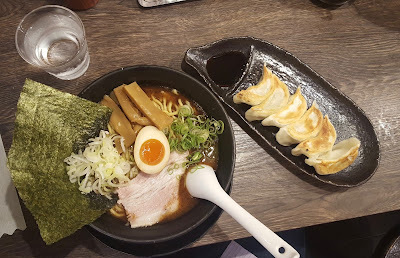 So I went with a bowl of noodles with a remarkable fish broth, and some crisp gyoza on the side. Blood sugar regulated. Life was good. I had about a half hour to kill, so I stopped into Abbot's Choice to start my whisky night. I'd spied a few of these bars on Google Maps when researching destinations. There's one in Golden Gai, Roppongi and Shibuya, but I never saw this branch on the map. Abbot's Choice is designed to appeal to Westerners or those with a Western hankering. The Ikebukuro Abbot's was very roomy (for a Japanese bar) with a number of bar tables that wouldn't look out of place at Buffalo Wild Wings. HD sports lit up the many TV screens and American pop music floated down from ceiling speakers. I took a seat at the bar, opened up a whisky menu and quickly spotted something of interest. Yoichi 2000's. I'd seen the 1980's and 1990's selling for small fortunes, and I adore Yoichi, so this seemed like the perfect start. Yet, though there was only one other customer at the bar, it was impossible to get the attention of the two bartenders. You see, my fellow patron was an American woman in her 40s or 50s slugging shot after shot of Fireball, slurring and shouting her way through terrible approximations of Japanese. Both bartenders found it hilarious. Even putting ¥2000 in cash on the bar and calling out sumimasen didn't make me worthy of their business until she stumbled out of the bar, trying to drag one of them with her. At first I thought, "Damn, that's a terrible way to begin her night." But then I realized it was 10:15pm. The first shift of drinkers was clocking out. The second shift was clocking in. Its color is a medium gold. The nose is fruitier than expected, with lots of bourbon and new American oak influence. Caramel and butterscotch hard candies. Pears and grains. No peat. The palate leads with root beer and anise. More pepper than peat. Quite sweet with a silky mouthfeel. Very buttery too. After 10+ minutes a bitter bite slips in, providing a little bit of balance. More herbs with more time. It finishes with sweet vanilla and caramel. Malt. Minimal peat. Adding water makes it all much too sweet. Wow, what a let down. American oak secures the front of the stage and never steps back. The herbal bitterness helped the palate out a little bit, but the whole thing needed less sweetness and more of something earthy or smoky to give it dimension. It's not the worst Yoichi I've had—their new NAS is embarrassing—but such a stellar distillery should be able to put out a special release better than this. I departed Abbot's Choice ten minutes behind schedule. I'm going to skip ahead about 1.5 to 2 hours. I'll return to the missing section in Part 2. The Crane Bar -- Ha! Just kidding. One of the bars I was most looking forward to was The Crane. Located a few blocks from the train station, the bar was known to have a tremendous whisky selection, while being a bit on the fancy side. But early in the Ikebukuro experience, I learned that The Crane HAD CLOSED. Wat? Yep. In the middle of the Era of Crazy Whisky Prices, Tsurumi-san left the business. Of course my first question was, "What happened to all the whisky?!" We may never know. Quercus Bar was highly recommended in Chris Bunting's Drinking Japan book, but that was published six years ago. The two ratings on whiskybase are more recent and much less enthusiastic. The good news about Quercus is its design is the exact opposite of Abbot's Choice. It's small and personal. The wood design is simple. The mood is quiet. The entire right shelf behind the bar is full of dusty stuff. Most of the other bottles on the other main shelves can be found at other great bars around the city. Unfortunately the most exciting bottles on premises were off-limits, as they were private bottles belonging to members. The bartender was nice enough, though Will is a much better bartender. And on a final note, Quercus's prices were the highest of all the bars I've visited in Japan. So Will and I each ordered only one drink while we discussed Fukushima and death and other baubles. Its color is light amber. The nose is very much dusty old Teacher's-ish. (Apologies for the terrible description.) Bushels of oranges and lemons and apricots meet layers of dunnage and musty cask funk. More earth than peat. Curiously, the palate is more alive. Similar fruits to the nose, with McIntosh apples added in. Soil + metal meets cotton candy + lightly smoky peat. The peat moves far into the finish's background. Otherwise, it's mostly moderate levels of apples and earth. 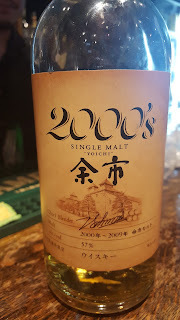 The opposite of the Yoichi 2000's: very little oak, lots of spirit character; pleasant peat levels, a good balance and an impressive amount of dimension for its age. It's a type that's sorely missing from modern whisky, though I think Benromach comes pretty close to it at times. I do recommend this if you have a chance to try it, though I don't think it's worth the ¥3000 I paid for an ounce. It wasn't yet 2am when we left Quercus. There was more to explore. I'll return to the better components of that evening in Part 2, next Monday. 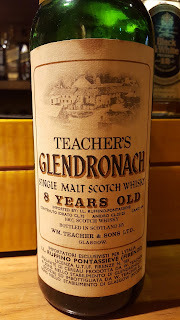 The Glendronach sounds a fair bit like that Whisky Galore cask, though maybe dirtier. Had to go back and check my notes on that one. You're right, there appears to be plenty of similarities, maybe a little more peat and dust on the 8yo. 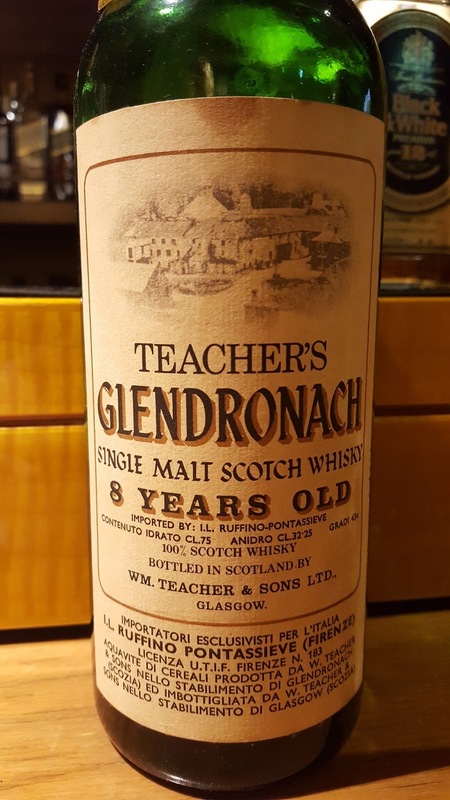 All the dusty collectors are chasing after the old ex-sherry Glendronach releases. Hopefully that'll keep the price of the ex-bourbon ones almost within range because those are the ones that interest me. I really wanted to like Quercus, given the location and atmosphere of the place, but if you're going to serve $60 glasses of whisky, I want a bartender in a tuxedo masterfully carving out ice balls behind the counter, not some 20-something guy in a polo shirt who doesn't seem all that interested in whisky and probably spends most shifts lamenting the fact that there are no female customers to chat up. He was a decent-enough guy beyond that, though :) That being said, I'd rather not have the tuxedo-wearing bartender, nor the ice balls, and I'm fine with the casual dude in the polo shirt; just make sure the prices reflect the image of the place, which is a small basement bar on the east side (quiet side) of Ikebukuro at the edge of No Man's Land. Too bad Oasis was closed. Oasis, someday. A shame that Quercus's prices were so high. I remember the ¥¥¥ he quoted me on some of the dusty blends were very silly. There's no demand for that stuff other than from one nerd a year, maybe.